Happy Monday friends! 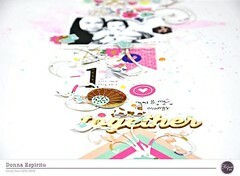 Today, I am sharing my first layout using the July Clique Kit. I love this month’s kit. It’s been awhile since I scrapbooked a layout using products from Elle’s Studio. I really like the patterns and die cuts! A few weeks ago, just few days before the last day of school, I went through Edward’s book bag. While I was going through his bag, pulling out his recess bag of toys and such, I came across this little booklet he made at school. It was titled, “My End of year Memory Book.” I get excited when I see these little booklets because I get to read what he writes without having to ask him what he learned that day etc. I don’t know why, but I can never decide where to place my enamel dots! They never look right. Ever. Is it just me or does this happen to you too?! I used one of the die cut tags as a template for my journaling tag. After I printed my journaling on white cardstock, I covered the typed journaling with a tag and cut around it. Then I did the same with the transparency sheet and layered it on top of the journaling tag with a sticker heart. I really like how it turned out. Normally, I use the sentiments from my die cut packs for the title, however, for this layout, I wanted to mix it up a bit so I used two different alphas for the title. Categories: Yearbook | Tags: American Crafts, clique kits, Elle's Studio, journaling, pretty little studio, Tags | Permalink.